The Dorset culture Palaeo-Eskimos now began to occupy winter houses built from stone and turf. The use of smokeless oil lamps for cooking and heating, instead of an open fire, allowed them to build dwellings that were more tightly closed and insulated. Dorset winter houses were relatively large structures, rectangular in shape and usually measuring between four and five metres on a side. The foundation was dug ten to fifty centimetres deep into dry soil or gravel, to provide insulation and protection from the wind. The walls were built using the material dug from the house floor, supplemented by boulders and insulating blocks of turf. Roofs were probably covered with skins supported by driftwood poles, and the entire house was probably heaped with snow for more insulation. The interior arrangement of such a house seems to have been based on the mid-passage of earlier Palaeo-Eskimo dwellings, with a central alley paved and bordered by stone slabs separating living and sleeping areas to either side of the house. However, instead of a hearth, which was the centre of earlier Palaeo-Eskimo tents, these houses had a central location for an oil lamp. 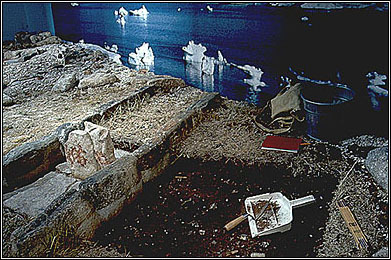 The reconstruction of a Late Dorset house in the exhibit is based on an archaeological site recently excavated on the west coast of Ellesmere Island. The site dates to around A.D. 1000 and consists of a single dwelling. Excavation of the site uncovered a flagged stone floor, a central passage marked by vertically placed slabs of stone and a hearth flanked by stones on which to rest a cooking pot. Among the artifacts found on the floor of the house was a small wooden carving of a human head with inset ivory teeth. A small boulder-covered cache close to the dwelling was used to protect a supply of frozen meat from scavenging foxes and wolves. Another external feature was more interesting: a small hearth a few metres from the house was heavily sprinkled with red ochre, a mineral powder the Dorset people seem to have used in association with religious activities. Lying in the ochre-stained earth was a small spatula-like object, one end of which is carved in the shape of the head of an eider duck. We don't know how this hearth was used, but we suspect that it was the centre of a religious ritual carried out by the occupants of the house. The cold, dry Arctic environment, and the permanently frozen soil, provide excellent conditions for preserving artifacts and other evidence. Most of the carvings you will see in the exhibition came from archaeological sites such as the one reconstructed here.